Each marching band member will be assigned an instrument number by your section leader during band camp. This is an important number and you need to remember it! It is recommended that you take a picture of your coordinate sheet AND put it in the front page of your filp folder. Your instrument and number are printed at the top of your sheet. In the example below, EUPHONIUM 1 is indicated as E1​. - The SET ​column indicates the Set number. - The MOVE ​column indicates how many counts are between each Set. - The LEFT-RIGHT ​column indicates your distance left or right of a yardline. This can be somewhat confusing for some people. The terms "inside" and "outside" refer to your direction in relation to the 50 yardline. For example, if you are "outside" of the 45 yardline, your spot will be on the end-zone side of the yardline. If you are "inside" the 45 yardline, your spot will be 50 yardline side of the yardline. 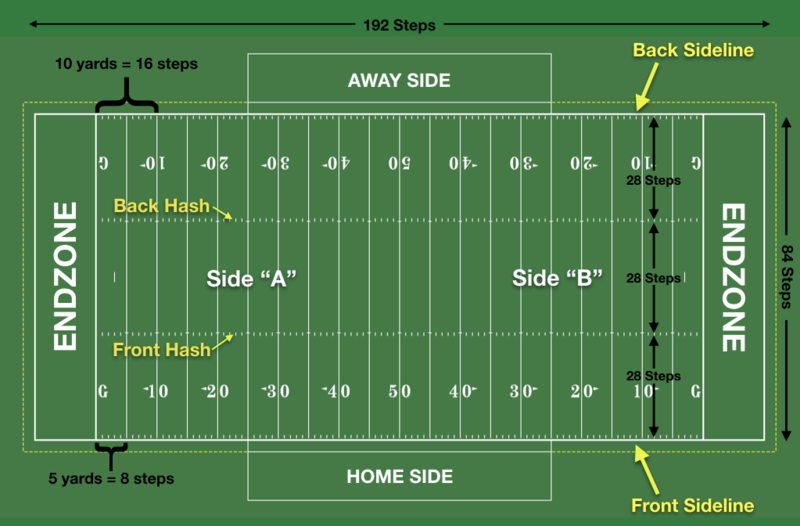 - The VISTOR-HOME column indicates how many steps your are away from sidelines and hash marks. ​In this column you will see the terms "behind" and "in front".